We recently made an enhancement to our Firmware Connect App. 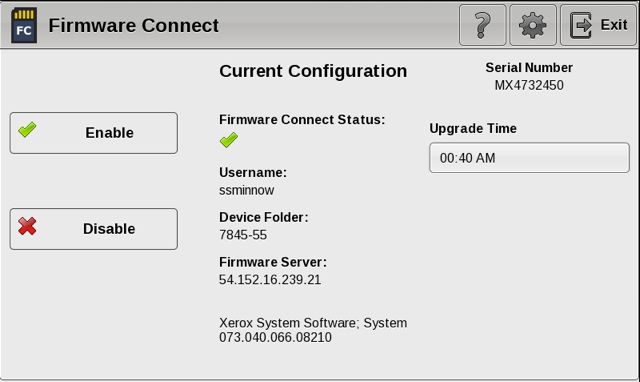 With the Firmware Connect App, firmware and software updates on many Xerox models are automatic. Automatic firmware updates increase customer satisfaction, increase equipment reliability, increase network security, decrease service calls and decrease the customers workload of performing these updates manually. Previously, the app automatically downloaded and installed new firmware during the evening or early morning hours at random intervals. Now, customers can chose the upgrade time that works best for them. For some places, upgrading at 2am may not be a great idea and 8am would work better. Click here for additional information on the Firmware Connect App and the Automatic Firmware Updates Solution.